The Ukrainian military involved in the anti-terrorist operation in eastern Ukraine is conducting raids and isolating areas controlled by militants, the Ukrainian National Security and Defense Council said on Wednesday. 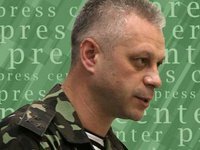 "The circle around the Russian mercenaries' positions near Stakhanov, Alchevsk and Luhansk is narrowing, but the militants are making attempts to break through," Andriy Lysenko, an official with the information center of the Ukrainian National Security and Defense Council, said. Lysenko also said the Ukrainian military destroyed two Grad systems and their crews using artillery near the villages of Orlovo-Ivanivka, Shakhtarsk district of the Donetsk region, in the past 24 hours. He also said the Ukrainian troops had contact with the militia in the populated areas of Orlovo-Ivanivka, Kumachove, Shumy, Novoivanovka, Maryivka, Krasny Yar, Stukalova Balka, Savur-Mohyla, and the Luhansk aerodrome 25 times in the past 24 hours.